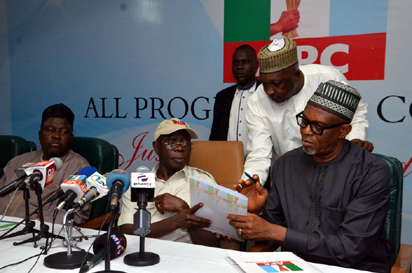 APC Screening Committee : From left, APC National Welfare Secretary , Alh. Ibrahim Masari, National Chairman of APC , Comrade Adams Oshiomhole, National Organizing Secretary , Hon. Emma Ibediro , National Auditor Chief Dr. George Moghalu National Vice Chairman North Suleiman Wambai and Director of Organizing Mr. kariy at Inauguration of Screening Committee Members for APC Senate and House Aspirant at Party office in Abuja. Photo by Gbemiga Olamikan. Accortding to Mr. Yekini Nabena, the Acting National Publicity Secretary, he said in an email on Monday that ‘the National Working Committee (NWC) of the All Progressives Congress (APC) has rescheduled governorship primaries in Lagos, Enugu and Adamawa states. The mode of primaries for Enugu and Adamawa states has also been changed from INDIRECT to DIRECT Primaries. The new dates for Lagos Governorship Primaries is Tuesday, October 2, 2018 while Enugu and Adamawa direct governorship primaries is Thursday, October 4, 2018.